Transform your skin with the Ecooking Derma Roller, an anti-ageing skincare tool that works to improve tone and texture. Suitable for use on the face, neck and décolleté and all skin types, the roller works to stimulate circulation and improve elasticity for a firmer and more youthful-looking facial contour. Lightweight and easy to use, the roller helps to smooth out fine lines and wrinkles, tighten sagging skin and reduce the appearance of pores, scars and pigmentation. After use, skin will be smoother, brighter and visibly rejuvenated. 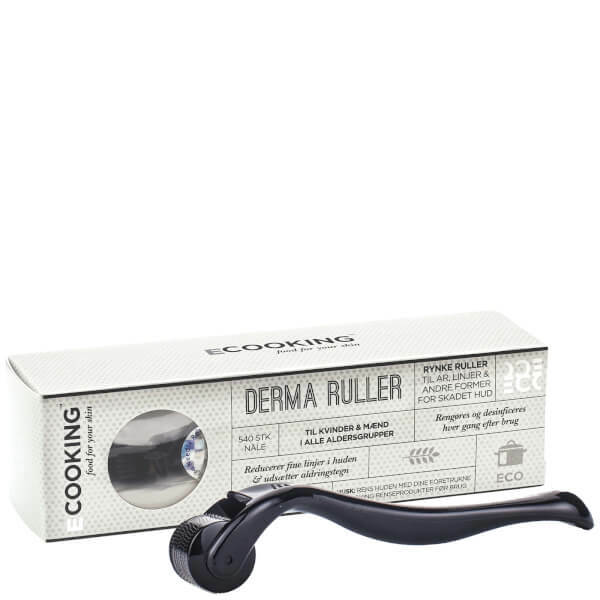 We recommend that you use Ecooking Derma Roller at night. Cleanse your skin before use. Treat one area at a time starting with e.g. cheeks. Roll with an even but gentle pressure both horizontally/vertically/diagonally. Continue at a new area. Remember to lift the roller when changing direction in order not to roll too many times in one area. Apply your favourite serum. When the serum has been absorbed, apply your Ecooking Night Cream. Cleanse your skin with your favourite cleansing products from Ecooking before use.